A half a year old already. How can it be? Time is going by way too fast. This month you have grown so much and are doing so many new things. You can sit up now (you fall down sometimes but you sat up for about 10 minutes today). You are going to crawl any day. I am not ready for that. You like to move. You've liked to move since you were developing in the womb. You moved all day long and all night long. I told daddy that we were in for it with you and I think I was right. You are never still. Even when you sleep you move all the time. You are going to take off crawling and I'm not sure I'm going to be able to keep up with you. You are wearing 6 month clothes. You can still wear some of your 3-6 month clothes but not many. I won't know what you weigh until your Dr. appt. on Monday but I'm guessing you are close to 16 pounds. You wear a size 2 diaper. You have started eating food although it's not going great. You are not thrilled about eating from a spoon. Mommy loses her patience easily but we're trying a couple of times a day. I'm sure you'll have it down in no time. You are the happiest baby I have ever seen. You smile all the time. You are never upset unless you are hungry or tired. You still spit up a lot because of your reflux but even when you are spitting up you have the biggest smile on your face. It is contagious. You smile at everyone. Today, you and I went to the mall while Julianne was at school and you smiled at about 20 different strangers who stopped to talk to you. I can tell that you are going to have the sweetest personality. You are taking two naps a day for about 2 hours each. You sleep 10-12 hours at night. You love sleeping on your belly. You are drooling like crazy. I keep thinking you will get a tooth any day but I thought that with your sister too and she didn't get her first until she was 11 months old. We did a photo shoot today but the difference was that today I had an assistant, your sister. It was interesting. She kept saying "say cheese Claire" and running around like a maniac. It made you smile though. I put you in a really cute outfit that my Aunt Debbie sent you. You loved the flower (loved to chew on it that is). You sat up in the chair for so long. What a difference from last month when you were still falling over. I think these were the first pictures I got to take of you sitting in the middle of the chair instead of propped up on the side. See? Happy. That smile just melts me. Julianne and I were saying "peek a boo" and making funny noises and you loved it! I love your chubby arms (and your double chin)! You stick your tongue out at me a lot now. And yesterday, you started blowing bubbles back at me when I do it to you. This is how strong you are. You get on all fours and then rock back and forth. Yesterday, you pushed your feet up, went on to your tiptoes and got in a downward facing dog position. I always loved the stage of sitting up and not crawling yet but I think that stage is going to last about a week with you. Could those eyes be any bigger? You have my eyes and look exactly like my baby pictures. You were trying to crawl...again. This is your sister acting all crazy trying to get you to "say cheese"
You can no longer be changed on your changing table because you roll over and try to pull the mirror off the wall. It is really hard to change your diaper. 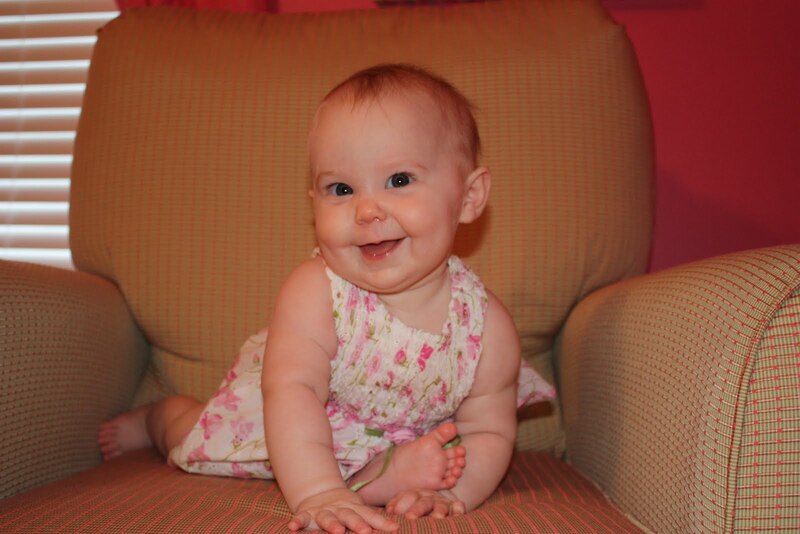 Just for comparison sake, here is your sister at 6 months. Happy 6 months Claire bear! I can't even express how much joy you bring me on a daily basis. You, your sister, and daddy make me so happy. I couldn't be more blessed. We love you so much! love the smile. love the chair. love the picture! So cute! she is beyond precious! Oh my goodness, she is darling and I LOVE her nursery! Your girls are just darling. They are soo cute!! I love the room, colors and the chair! Oh how I love your chair!! I am beaming with jealousy. How do you like the green walls, I am torn between green and mauve type pink in my little girls room. No one shares my vision everyone tells me no on the green, its good to see that green would be cute too and not a disaster like everyone thinks. Soo cute!! Time is flying by! !